Sister Ship "Allure of the Seas"
Oasis of the Seas will be the world’s largest and most revolutionary ship introducing the cruise line’s new neighborhood concept, which will provide vacationers with the opportunity to seek out relevant experiences in seven themed areas based on their personal styles, preferences or moods. Off the Boardwalk, the first amphitheater at sea, AquaTheater, will celebrate water with the largest freshwater pool found on a ship offering a full spectrum of activities and performances for guests. Created to offer two unique experiences, AquaTheater will allow guests to swim in the theater’s magnificent kidney-shaped pool, relax on sun loungers located on tiered platforms surrounding the pool, and even take SCUBA lessons in the afternoon. At night, it will deliver a complete sensory experience playing on the element of surprise as audience members witness the venue come alive with heart-pounding theatrical performances featuring dramatic acrobatics, synchronized swimming, water ballet, and professional high-diving, as well as elaborate fountain shows synchronized to music and lights. The ship cost $1.5 billion and took two and a half years to build at the STX Finland Oy shipyard in Turku, southwestern Finland. The liner has four swimming pools, volleyball and basketball courts, and a youth zone with theme parks and nurseries for children. There is also an ice rink that seats 780 spectators and a small-scale golf course. Enhancements to the cruise line’s signature Royal Promenade, the heart of the ship, will include a mezzanine level that overlooks the main promenade below. The Crystal Canopy sculptured-glass domes will allow natural light to cascade down from the sky. There will be a vast array of shopping, dining and entertainment options including, the Rising Tide bar, the first moving bar at sea, which will traverse three decks and allow cruisers to enjoy a cocktail as they slowly ascend into Central Park, the neighborhood above. .A series of columns interlaced with vines will be just one of the welcoming entry points into Central Park, elegantly landscaped with tropical foliage and seasonal flowers, shrubs and trees. Drawing on the concept of surprise and intrigue, garden spaces throughout Central Park will sprout from charming pathways. The Pergola Garden will be a unique interpretive plant garden, featuring vegetation from a host of Caribbean locales where guests will see shade-grown Coffee plants and budding Pineapple plants, as well as learn about the origin of spices, such as cinnamon and nutmeg. The Sculpture Garden will integrate artwork from international artists and unique plantings, while Sweet Olive trees will frame a cozy area to sit and enjoy a view of the Park. The Chess Garden will be located next to a large Cuban Laurel tree and framed with Painted Bamboo where guests can challenge each other to a game of chess or checkers with large-scale pieces. Or for a more intimate experience, personal game tables will be found off the main path. The middle pathway will transport guests over a bridge spanning a ’river of plants‘ and past a series of special gardens, restaurants and cafés, as well as boutique shops to the central square, lined with colorful Kumquat and lacey Black Olive trees. The Park’’s horticulturalist will teach guests about the Central Park gardens, general gardening techniques, and provide lessons on the distinctive and unusual ecology of Caribbean plants. Irrigation and drainage systems will be incorporated, along with micro-climate control techniques. 2.Boardwalk will be a breathtaking space for families. Inspired by the nostalgic seaside piers of yesteryear, Boardwalk will dynamically engage the entire family in classic fun – whether young or just young at heart – with eateries, retail outlets, and carnival games. An original, handcrafted carousel – the first at sea – will be the centerpiece of this vibrant neighborhood. Other surprises include two 43-foot rock-climbing walls on either side of the AquaTheater and the first zip-line at sea suspended nine decks above Boardwalk. A natural evolution of the signature Royal Promenade featured on Voyager- and Freedom-class ships, the new design found on Oasis of the Seas will allow guests to have a physical connection with the neighborhood above – Central Park – as natural light cascades down from the sky. Giant glass-arched skylights, the Crystal Canopies, will form a sculptured roof that will look up into Central Park and the sky beyond. The unique Rising Tide bar – the first moving bar at sea – will be an engineering feat that span three decks and allow cruisers to enjoy a cocktail as they slowly descend from Central Park and arrive into the Royal Promenade. Suspended above the Globe and Atlas Pub, an unfurling bridge on hinged hydraulics will create a spectacular, surprise element for guests. Incorporated into the pub’s facade, a giant copper globe will “crack open” as part of its unique construction and extend over the Royal Promenade as a bridge platform. A focal point of the Royal Promenade, the bridge will be approximately 10 feet above and adjacent to the entertainment area for performances. Towards the aft of the Royal Promenade, a mezzanine level will allow for sweeping views of the promenade and feature the cruise line’s Schooner Bar, Adventures with Royal Caribbean International, and the Diamond Club, an exclusive lounge for Crown & Anchor Society loyalty members. Another first for the cruise line, the Royal Promenade will serve as the entry point for all guests embarking on Oasis of the Seas, rather than the traditional lower decks. A vast tree sculpture by international artist Larry Kirkland will serve as an impressive welcoming spot. Neighborhoods 4 - 7 - The themes of the next four neighborhoods will revolve around: entertainment, youth passengers, sports (yes, a FlowRider will be on board) and spa/fitness. Other features among these coveted 28 lofts will be a unique modern design dotted with abstract, modern art pieces; spacious living areas on the lower level with contemporary detailing; and a private balcony with sun chairs and stunning views to help guests unwind. Each loft, which will measure 545 square feet (51 square meters) or larger when combined, and will be fitted in contemporary décor with a Caribbean influence. The impressive design will include an upper-level bedroom that overlooks the living area and extended ocean views. Beds will be outfitted with white, luxurious duvets complemented by tropical blue and green accents that tie into the loft’s natural surroundings. The lofts will feature LCD televisions, separate vanity areas, a guest bathroom downstairs and an upstairs master bathroom featuring his and hers shower heads, fog-free mirrors, and limestone mosaic tile accents. Code Category Description Sq. Ft. Balc Sq. Ft.
RL Royal Loft SuiteThe Royal Loft Suite offers a living room and dining room with a dry bar. One bedroom w/convertible twins on the main level, bathroom w/shower on the main level. Loft Master Suite on the upper level with a master bath w/tub/shower, two sinks, bidet, and stairway to upper level. Private balcony with whirlpool and dining area w/dry bar. This category can hold up to six guests. Can be adjoined with one (1) Crown Loft Suite; staterooms 1740 and 1738. 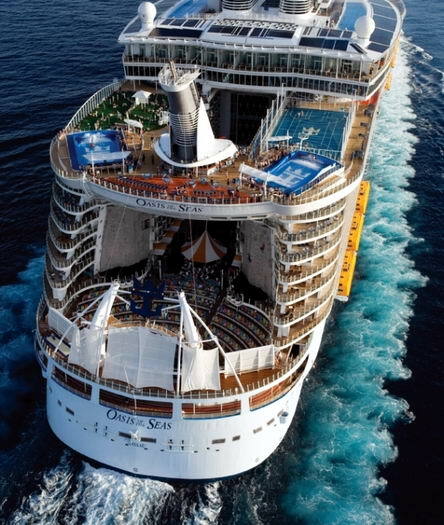 Oasis of the Seas will be the largest and most revolutionary cruise ship in the world. An architectural marvel at sea, she will span 16 decks, encompass 220,000 gross registered tons (GRT), carry 5,400 guests at double occupancy, and feature 2,700 staterooms. Oasis of the Seas will be the first ship to tout the cruise line’s new neighborhood concept of seven distinct themed areas, which includes Central Park, Boardwalk, and the Royal Promenade. The ship will sail from her home port of Port Everglades in Fort Lauderdale, Fla.
With the astounding array of choices and amenities being introduced on Royal Caribbean International’s next generation of cruise ships, vacationers will be hard-pressed to find another experience as spectacular as what they will enjoy on Oasis of the Seas. Today, the cruise line renowned for its innovations announced seven-night Eastern and Western Caribbean itineraries for the new ship’s inaugural year, with the inaugural voyage planned for December 05, 2009. . The ship’s homeport is Port Everglades in Fort Lauderdale, Florida. Western Caribbean itinerary, which will call at Labadee, Royal Caribbean’s private beach destination in Haiti; the new port of Falmouth, Jamaica; and Cozumel, Mexico. Royal Caribbean is working with the government of Haiti to construct a pier at Labadee, the cruise line’s private beach destination. Additional plans are underway to expand guest offerings with an alpine coaster and fast-boat tours, among others, to complement Labadee’s stunning Dragon’s Breath Flight Line, which has proven to be one of the destination’s most popular attractions. With the introduction of the neighborhood concept, Oasis of the Seas will debut a new portfolio of 37 categories of accommodation options, many with views unique to the ship. Park View and Boardwalk View balcony staterooms offer inward facing accommodations overlooking the two open-air neighborhoods. Another industry-first, the introduction of 28 contemporary two-level loft suites will redefine cruise ship accommodations with vibrant, ocean-inspired colors in a sophisticated and spacious setting. The lofts will be the highest accommodations at sea, offering spectacular views of the ocean, and floor-to-ceiling, double-height windows to ensure the view will be enjoyed from every vantage point. "Take The Next Step Towards This Dream Vacation"